Commissioner Vestager is addressing the press about the decision of EU to not sanctions GAZPROM. © European Union , 2018 / Source: EC – Audiovisual Service. This article is brought to you in association with the European Commission. The European Commission has adopted a decision imposing on Gazprom a set of obligations that address the Commission’s competition concerns and enable the free flow of gas at competitive prices in Central and Eastern European gas markets, to the benefit of European consumers and businesses. Gazprom is the dominant gas supplier in a number of Central and Eastern European countries. In April 2015, the Commission sent a Statement of Objections to Gazprom. It set out the Commission’s preliminary view that the company breached EU antitrust rules by pursuing an overall strategy to partition gas markets along national borders in eight Member States (Bulgaria, the Czech Republic, Estonia, Hungary, Latvia, Lithuania, Poland and Slovakia). This strategy may have enabled Gazprom to charge higher gas prices in five of these Member States (Bulgaria, Estonia, Latvia, Lithuania and Poland). No more contractual barriers to the free flow of gas: Gazprom has to remove any restrictions placed on customers to re-sell gas cross-border. Obligation to facilitate gas flows to and from isolated markets: Gazprom will enable gas flows to and from parts of Central and Eastern Europe that are still isolated from other Member States due to the lack of interconnectors, namely the Baltic States and Bulgaria. 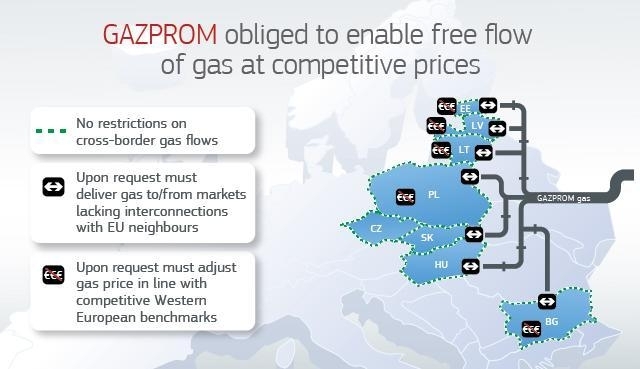 Structured process to ensure competitive gas prices: Relevant Gazprom customers are given an effective tool to make sure their gas price reflects the price level in competitive Western European gas markets, especially at liquid gas hubs. No leveraging of dominance in gas supply: Gazprom cannot act on any advantages concerning gas infrastructure, which it may have obtained from customers by having leveraged its market position in gas supply. Combined, these obligations address the Commission’s competition concerns and achieve its objectives of enabling the free flow of gas in Central and Eastern Europe at competitive prices. Therefore, the Commission has decided to make these obligations (so-called “commitments”) legally binding on Gazprom (under Article 9 of the EU’s antitrust Regulation 1/2003). If a company breaks any of these obligations, the Commission can impose a fine of up to 10% of the company’s worldwide turnover, without having to prove an infringement of EU antitrust rules. More generally, effective competition in Central and Eastern European gas markets does not only depend on the enforcement of EU competition rules but also on investment in gas supply diversification, well-targeted European and national energy legislation and their proper implementation. This is why it is a key priority of the Commission to build a European Energy Union. To address the Commission’s competition concerns, Gazprom has to comply with a set of obligations aimed at ensuring the free flow of gas at competitive prices across Central and Eastern Europe. These obligations on Gazprom will be in place for eight years. They reflect feedback from stakeholders in a market test, which the Commission launched in March 2017 on an earlier version of the proposal. This market test resulted in a significant number of replies from a wide range of stakeholders, including governments, national competition authorities, gas wholesalers, industry associations and academics, which helped to clarify and ensure the effectiveness of the final obligations. The Commission was concerned that Gazprom imposed territorial restrictions in its supply agreements with wholesalers and some industrial customers in all eight Member States (Bulgaria, the Czech Republic, Estonia, Hungary, Latvia, Lithuania, Poland and Slovakia). These restrictions include export bans and clauses requiring the purchased gas to be used in a specific territory (destination clauses) and other measures that prevented the cross-border flow of gas. In response, the Commission decision requires Gazprom to remove all such contractual barriers to the free flow of gas in Central and Eastern European gas markets, regardless of whether they make cross-border sales impossible or merely financially less attractive. Gazprom will also not re-introduce such clauses in the future. Furthermore, Gazprom has to adapt provisions in its contracts regarding the monitoring and metering of gas in Bulgaria, which have isolated the Bulgarian gas market from neighbouring EU gas markets. This will allow the transfer of control from Gazprom to the Bulgarian operator of the gas transmission infrastructure. Following the market test, Gazprom clarified a number of technical elements to ensure the obligation would be fully effective. These obligations will remove contractual obstacles created by Gazprom, which stand in the way of the free flow of gas in Central and Eastern Europe. For gas to actually flow freely across Central and Eastern Europe, it is also necessary to have infrastructure in place for its transport, namely interconnectors that link national gas markets with each other. Such infrastructure already exists in the Czech Republic, Hungary, Poland and Slovakia. However, infrastructure connecting Bulgaria, Estonia, Latvia and Lithuania with neighbouring EU gas markets is not yet sufficiently available. This limits the ability of Gazprom’s customers to re-sell their gas to and from these countries, even if they have spare volumes. Swaps offered to a wide range of Gazprom customers: Gazprom has to make this option available to relevant customers that have (or will have) gas contracts for the delivery of gas to certain delivery points in Central and Eastern Europe. Following the market test, this will apply to contracts with a duration of at least 18 months. The mechanism would not be workable for shorter contracts, since the minimum duration for gas delivery to a new delivery point is twelve months preceded by a four-month notice period to Gazprom. Swaps available in both directions, to and from isolated markets: Relevant Gazprom customers have the possibility to ask Gazprom to deliver their gas to the Baltics and Bulgaria instead of the originally agreed delivery points (from Poland or Slovakia to the Baltics and from Slovakia or Hungary to Bulgaria). Following the market test, such swaps will be possible in both directions. This will make the mechanism more effective and lead to a better integration of Central and Eastern European gas markets. Fixed and transparent service fees for the delivery: The fees that Gazprom can charge for this service are fixed and transparent. Following the market test, they were significantly reduced to make the mechanism financially attractive. Flexibility for Gazprom’s customers to exercise this option: Following the market test, Gazprom’s customers can exercise these options for smaller quantities of gas (50 million m3) and at shorter notice (four months). Limited grounds for Gazprom to refuse to perform the swap: Following the market test, Gazprom can only refuse to perform the swap if there is no transmission capacity. This will be closely monitored by an independent trustee. This mechanism enables gas to flow to and from the Baltics and Bulgaria, as if gas interconnectors with EU neighbours existed already. It will allow Gazprom’s customers to seek new business opportunities even before interconnectors become available, to the benefit of consumers and businesses in Bulgaria and the Baltic States. The Commission was concerned that Gazprom may have been able to charge higher prices in five Member States (Bulgaria, Estonia, Latvia, Lithuania and Poland). Customers can demand lower price when their gas price diverges from competitive Western European price benchmarks: Gazprom’s customers will have a contractual right to ask for a lower gas price, if the price they pay diverges from competitive Western benchmarks, including prices at liquid hubs. They can exercise this option at frequent intervals (every two years), with an additional “joker” every five years. Following the market test, existing customers can exercise this right immediately after the Commission decision and Gazprom must offer this right also to new customers. New gas price must be set in line with price level in competitive Continental Western European gas markets: The new price must reflect competitive Continental Western European price benchmarks, including prices at liquid hubs. Following the market test, this guidance was considerably improved to explicitly refer to the price level in competitive Continental Western European gas markets, including prices at the most relevant liquid hubs in Continental Europe, namely TTF in the Netherlands and NCG in Germany. The new lower price will be applied retroactively from the date of the price revision request. Arbitration if Gazprom does not agree within a strict deadline: If Gazprom and its customer do not agree on a new price within 120 days, the dispute can be referred to an arbitrator. The arbitrator will then impose a competitive gas price that takes full account of the above-mentioned Western European benchmarks. Furthermore, arbitration must take place within the EU. Arbitration tribunals in the EU are under an obligation to respect and apply EU competition law. The Commission has the right to intervene in such cases as amicus curiae. This will ensure competitive gas prices in these regions and avoid that gas prices under the oil-indexed contracts significantly diverge from competitive price benchmarks in the future. The obligation applies to all contracts with a duration of three years or more as the pricing concerns in this case are only relevant for long-term contracts where new developments over time can lead to a significant deviation from competitive benchmarks. Finally, the Commission was concerned that Gazprom leveraged its dominant market position on the gas supply market to obtain advantages with regard to the access to or control of gas infrastructure. The Statement of Objections raised concerns in relation to the South Stream project in Bulgaria and the Yamal pipeline in Poland. As regards South Stream, the decision makes clear that Gazprom will not benefit from advantages that it has obtained. Gazprom will not seek any damages from its Bulgarian partners following the termination of the South Stream project. This is without prejudice to whether such claims would have been valid in the first place. As regards the Yamal Pipeline, the Commission’s investigation has shown that the situation cannot be changed by this antitrust procedure, as gas relations between Russia and Poland are determined by intergovernmental agreements. In any event, a decision by the Polish Energy Regulator in May 2015 did not confirm allegations that Gazprom would have foreclosed the Polish gas market with regard to the Yamal pipeline. The regulator found that the owner of the Yamal pipeline, Europolgaz (which is co-owned by Gazprom), is not able to delay or block investments on the pipeline: all investments, such as those enabling reverse flows from Germany, have been implemented as planned by the certified transmission service operator (Gaz-System). Finally, to better deal with future intergovernmental agreements, the Commission put forward a legislative proposal to make intergovernmental agreements on gas and oil subject to prior scrutiny by the Commission. This proposal has entered into force in 2017.